Kate Whelley McCabe and Justin McCabe met in a warehouse in Ohio in 2000. They were recent college graduates with hard hats and management jobs, working for a big supply company. Now, two children, two law careers and countless pancakes later, the couple has returned to their warehouse roots. 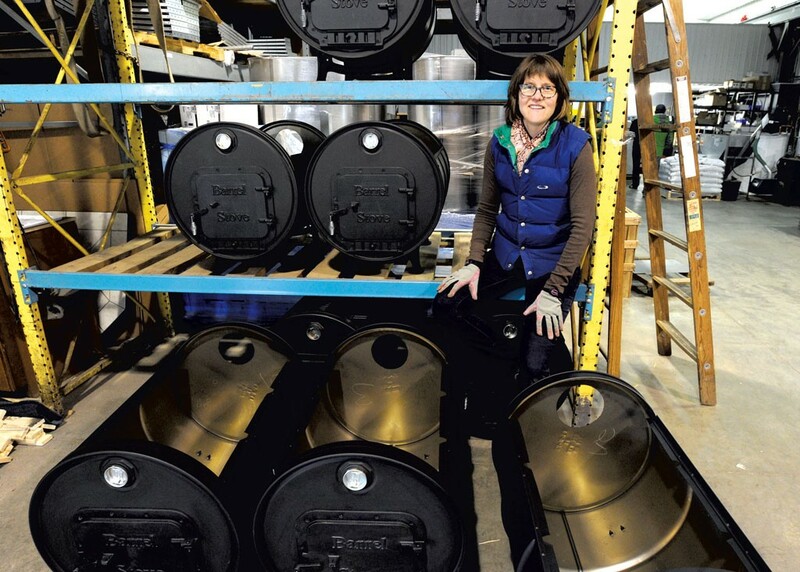 These days, the McCabes spend time in the Montpelier warehouse where they operate their small business: Vermont Evaporator Company, which manufactures family-size backyard evaporators for making maple syrup. The wood-fired evaporator, called the Sapling, is a handsome contraption with a design twist: It doubles as a grill for outdoor cooking. That design is the work of Justin, 39, a patent attorney and chemical engineer who makes the evaporators in his spare time. He likes to build things — such as a 60-by-40-foot hockey rink. "I have this thing," he said. "I just keep moving." Kate, 38, is a former prosecutor in the Vermont Attorney General's Office. When she left her job in the summer of 2015, her plan was to work in nonprofit management. Six months later, she found herself focused instead on the Sapling, a product whose inspiration flowed organically from her backyard maple trees. Those trees stand on 10 acres of land on the edge of Montpelier, where the McCabes moved four years ago from a house in town. They tapped the maples, then filled their turkey roasting pan with sap and placed it on the propane grill to boil. It took $50 worth of propane to make three-quarters of a gallon of syrup. "That's ridiculous," Justin recalled thinking. The McCabes looked for a small-scale evaporator that would be affordable, efficient and easy to use. When the products available on the market came up short, Justin decided to invent his own. He designed an evaporator and built a prototype in his garage. The Sapling was born. The main feature of Justin's evaporator is a 55-gallon steel drum, placed on its side, with the top section cut away to make a vessel for burning wood. The fabrication includes grinding the metal to prepare the surface for painting, cutting a side opening for adding wood to the fire, and welding and assembling the component parts, including cast-iron legs and a door. Atop the rig sits a sap tray or three cast-iron grates for grilling. The finished Sapling looks like a small train caboose or a sideways potbelly stove. It's an appealing object that makes you think you've seen it before — until you realize you haven't. "I was just amazed at how fast they sold," Justin said. "People were just so happy with them." That success comes as no surprise to sugarmaker Burr Morse, who owns and operates Morse Farm Maple Sugarworks in East Montpelier. Morse, who will turn 69 in two weeks, has been making maple syrup since he was a little boy. "It's probably a good thing, because there's a lot of people who want to start out sugaring on that kind of level," Morse said of the Sapling. "The manufactured small evaporators are really expensive. If they can keep this under $1,000, they're probably going to sell quite a few of them." Morse is the author of Sweet Days & Beyond: The Morse Family — Eight Generations of Maple Sugaring, a book that chronicles his family's tradition of maple sugaring in central Vermont. This year, Morse and his crew tapped 6,000 trees — yet he appreciates the appeal of a backyard operation. "It's a mystique to it," he said. "We're here in Vermont, and that's what we do in Vermont — why not? And it's good family fun, a good healthy activity for the kids. It gets them away from the cellphones and stuff." The McCabe kids were there, helping out, when the family fired up its Sapling last sugaring season. Over the course of three sugarmaking Saturdays, they made five gallons of maple syrup from the sap of 25 trees, Justin said. Elke, age 10, said you have to know when to pour the sap in and when to feed the fire, then check to see if the syrup is dark enough. She and her brother, Seamus, 6, pour maple syrup on waffles, pancakes "and anything that can have syrup," she said, adding that the maple syrup is "awesome." "I think if you eat something that you helped make, it tastes better than anything you might buy of that kind," Elke added. When her family started making maple syrup, Kate said, she recognized the aroma from her childhood in Moultonborough, N.H., where her neighbors sugared. She and her siblings would stop at their house on the way home from the school bus and get a Dixie cup of maple syrup for the rest of the walk. "We'd keep them company when they sugared," Kate recalled. "It's a social activity." The Sapling's design and utility combine to make it a fun outdoor hangout, a place to gather round the fire burning high and hot within. "You want the flame to be licking the pan," Kate said. After you've tapped the trees, collected sap and poured the sweet liquid through cheesecloth into the tray, making maple syrup becomes a "milling about" kind of activity, Justin said. A video on Vermont Evaporator Company's website, demonstrating how to use the Sapling, ends with the advice: "Light a fire and sit back." Sales of the Sapling have been brisk in the days leading up to this year's sugaring season, said Kate, who handles sales, marketing and other non-production aspects of the business. She expects production and sales to double in the coming year, from 110 to 220 Saplings. Justin continues to make them on weekends and in his spare time, churning each one out in 90 minutes. In the middle of January, he took most of a week off from work at the law firm and produced 40 Saplings. "When I tell my lawyer friends that this is what I do on weekends, initially they say, 'That's crazy!''' Justin said. "And then a look of envy washes over them." He has merged his professions by filing two patent applications for the Sapling: One is a design patent that would cover the look of the evaporator, the other a utility patent to cover the method of manufacture. The couple's parents help with the project when they visit from out of town. Kate's father, Peter Whelley, said he checks before packing to see if his Montpelier visit will include grinding steel in the warehouse. For those trips, Whelley brings his "expendable" clothes. "It's a family thing, another reason to come do stuff here," said Whelley, a school psychologist still living in Moultonborough. "It's a really positive thing to keep the family in touch — a commitment, a joint project." As a patent lawyer and a board member of the Generator maker space in Burlington, Justin knows Vermont has its share of creative and innovative people. The trick, he said, is moving from the invention stage to running a business. "Ideas are good," he said. "But you've got to be able to transition it. Kate and I are lucky to have that knowledge." Kate brings a particular expertise: In her former life as a state prosecutor, she specialized in consumer fraud cases. "I know some things not to do," she said. "And I know if I do them who will be calling me on the phone." The original print version of this article was headlined "Tapping a Tradition"